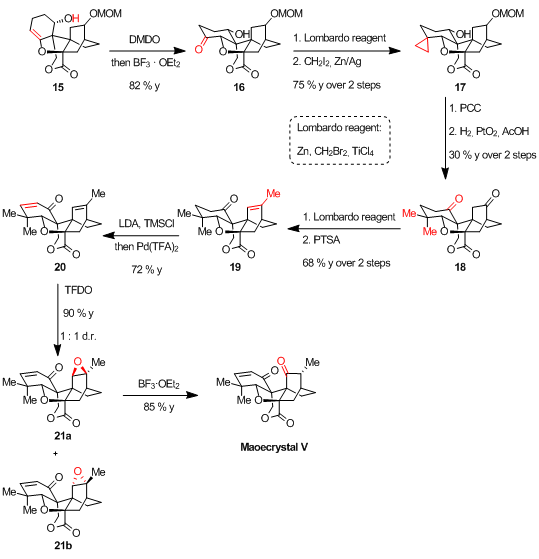 Yet another interesting synthesis of Maoecrystal V was just reported from Danishefsky and Peng. 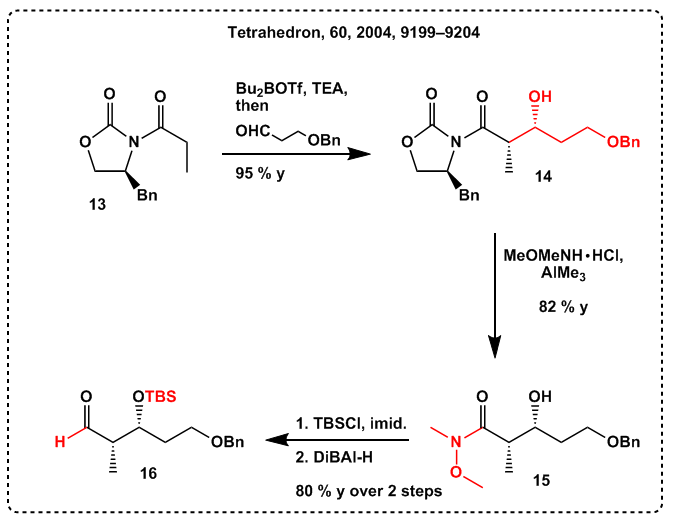 Besides the completed total synthesis a first attempt is also featured in this article which might have been successful when the crucial Diels Alder reaction would have given them the correct stereoisomer. 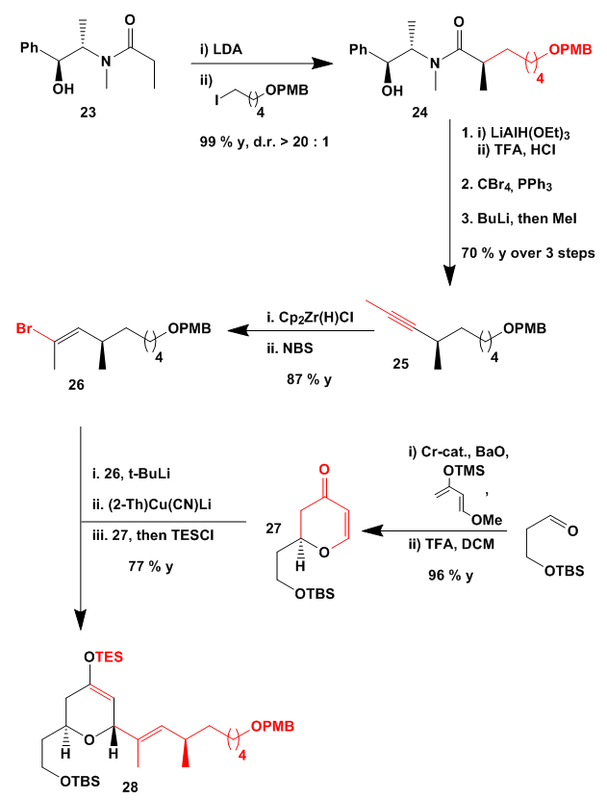 After straightforward preparation of precursor A Diels Alder reaction furnished B instead of C. This outcome puts paid to the whole strategy because there is no handle on the C2-bridge with which the required functionalities could be introduced. With this result in hand the group started a study which then turned out be the starting point of their revised synthesis. In the first step readily accessible precursors 1 and 2 where joined together in moderate yield. 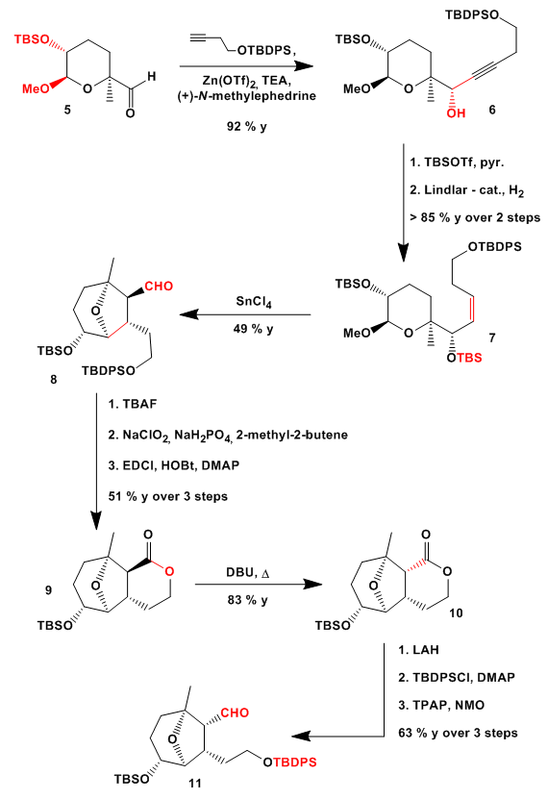 Global reduction with DIBAL-H and selective oxidation of the allylic alcohol gave 4 which was acylated with D and converted to TBS enol ether 5. 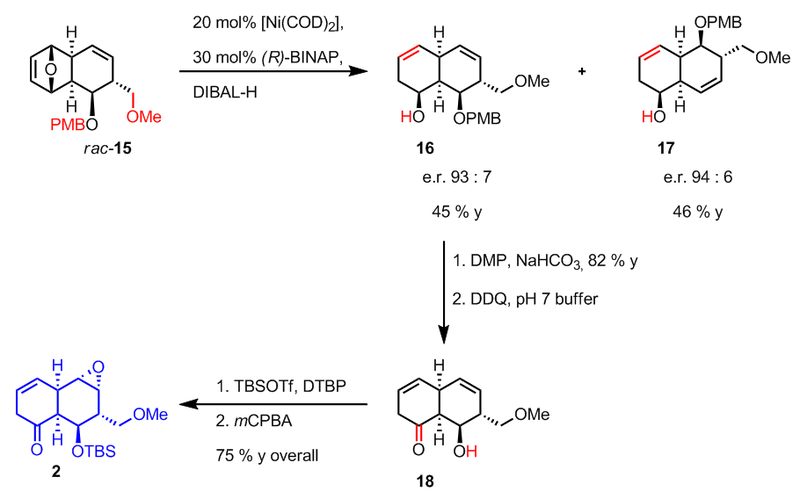 Under almost identical conditions as for the synthesis of B this time Diels Alder product 6 was obtained after TBAF mediated desilylation and base induced desulfinylation. Epoxidation of the unsaturated lactone double bond was followed by MgI2 facilitated opening of the epoxide with formation of the corresponding a-iodo alcohol. Dehalogenation was accomplished with Bu3SnH to give 7. Next the cyclohexadiene ring was functionalized. 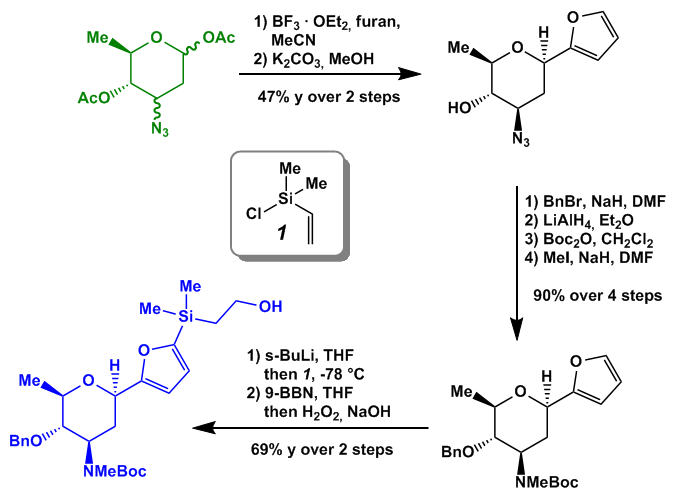 Stereoselective epoxidation with mCPBA and subsequent opening under acid catalysis furnished tetrahydrofurane 9. 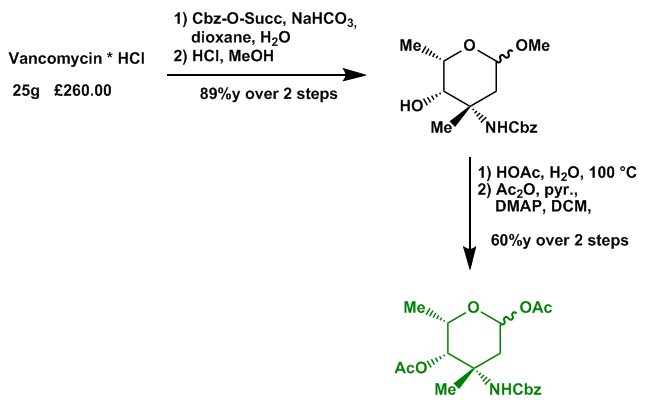 Acetylation of the alcohol and reduction of the ketone yielded an inseparable mixture of diastereomers which proved to be inconsequential because the alcohol will be transformed into a sp2 center during the synthesis. MOM-protection and deacetylation gave homoallylic alcohol which could be epoxidated again to epoxide 12. Oxidation and acetic anhydride assisted opening of the epoxide was followed by conjugate addition of phenyl thiol and reduction of the ketone to give thioether 14. Desulfination with Raney-Ni and elimination of the alcohol furnished at last enol ether 15. Though the functionalization of the cyclohexadiene ring seems to be pretty steppy the transformations could be executed in overall acceptable yield. To the end of the synthesis mainly the remaining methyl groups have to be introduced. Therefore again an epoxidation was used to functionalize the enol ether double bond. Note the overall inversion of the stereogenic center comparing 14 and 16. Under Lewis acidic conditions the epoxide was opened to ketone 16 in a Rubottom-type oxidation. Then a rather cool approach for the introduction of a gem-dimethyl group was utilized. First the ketone was transformed to an exomethylene group in the presence of Lombardo’s reagent. A Simmons-Smith cyclopropanation converts the double bond into the spiro-cyclopropane 17 which was opened under hydrogenolytic conditions after deprotection and adjustment of the oxidation states of the appendant alcohols. 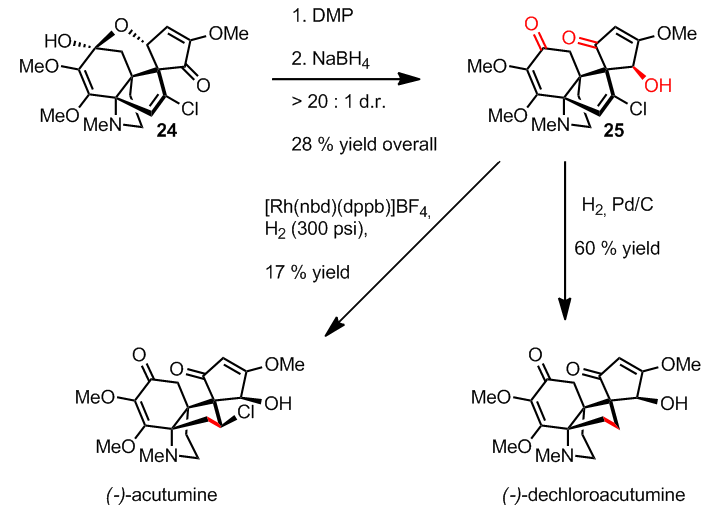 Chemoselective methylenation of the less hindered ketone was accomplished again in the presence of Lombardo’s reagent and followed by acid catalyzed migration of the double bond. 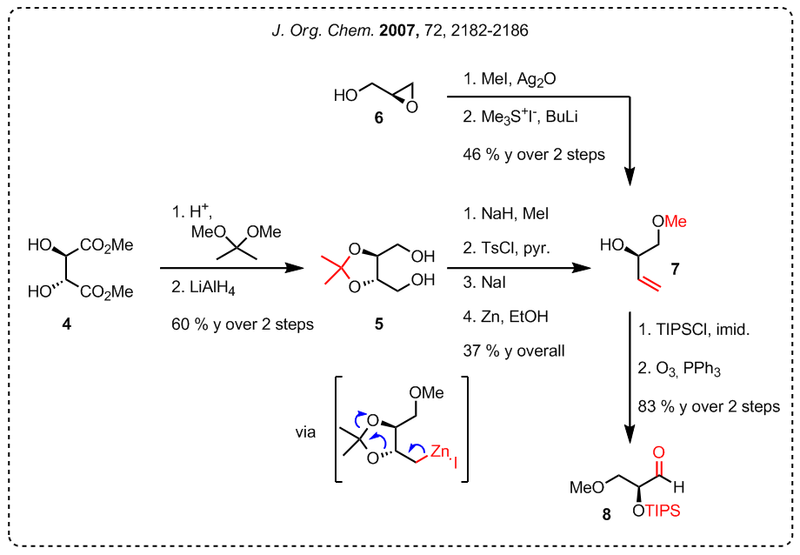 Saegusa oxidation, epoxidation with TFDO and Lewis acid assisted opening of the ketone produced Maoecrystal V.
 Though the following purification steps were of course be affected. As the title suggests this full account features a collection of approaches towards the central core of branimycin. All those who are interested in a great story of evolutionary chemical design really should have a look at the full paper. I will focus in this short write-up only on the longest linear sequence. As can be seen from scheme 1 the synthesis focusses mainly on three fragments where green fragment 1 and blue fragment 2 constitute the main part of the molecule. The synthesis of fragment 1 is described in a previous paper but also featured in the following. The evolutionary design is limited to the synthesis of 2 and fragment 3 is commercially available dimethyl malonate. The first route to allylalcohol 7 started from (R,R)-dimethyltartrate which was protected and reduced to diol 5. 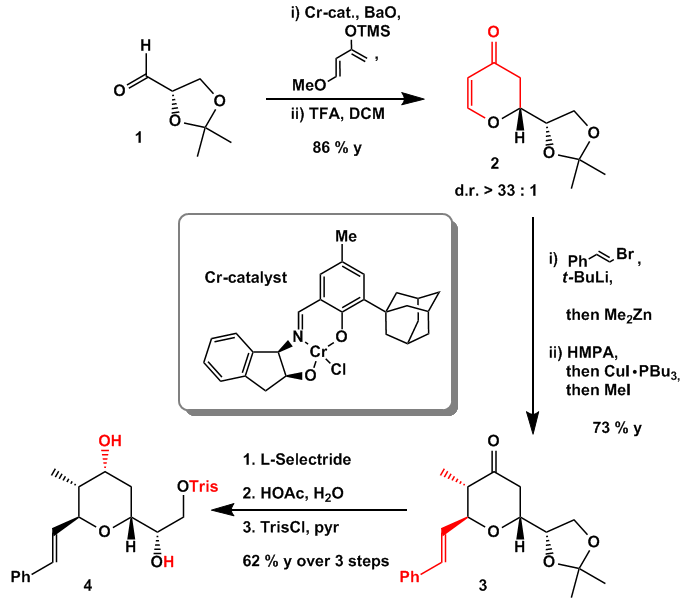 Methylation, tosylation, Finkelstein reaction, and reductive acetonide cleavage then furnished 7 in low yield. A more direct access from glycidol 6 is also presented. After methylation of the hydroxy function the epoxide was opened under Corey-Chaykovsky conditions to give 7. 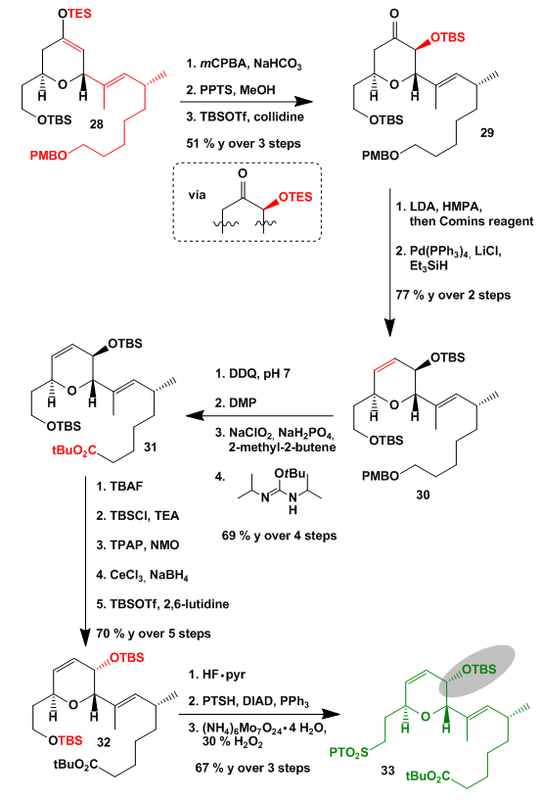 TIPS protection and ozonolysis of the olefin produced aldehyde 8. 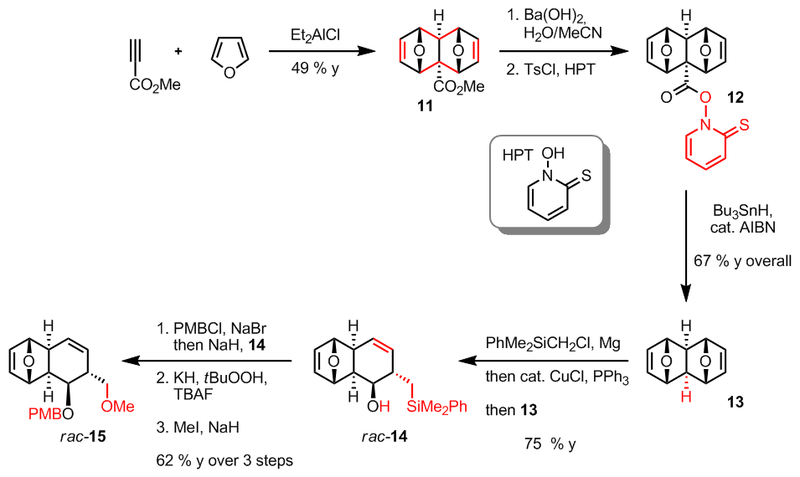 Next aldehyde 8 underwent a Marshall reaction with a chiral silylallene to give in high yield and stereoselectivity alkyne 9. Aqueous ammonium chloride was necessary for in situ deprotection of the resulting TMS ether. MOM protection of the alcohol and Schwartz reaction with subsequent iodine quench was used to arrive at vinyl iodide 10. 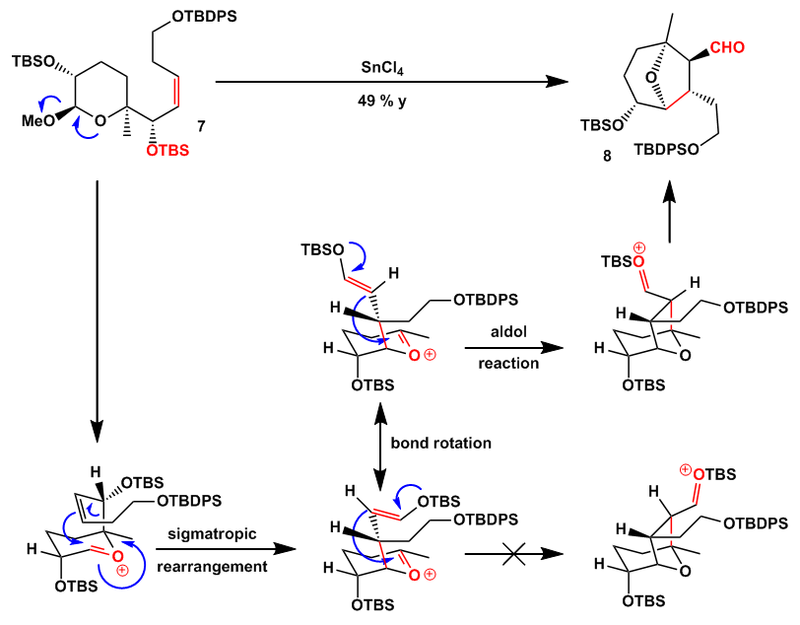 Protection group switch from TIPS to the more convergent cleavage TBS group is straightforward giving green fragment 1. The synthesis of the blue fragment began with Diels Alder reaction between two equivalents of furan and methyl propiolate. With ester 11 in hand the surplus ester group was removed following Barton’s protocol. Saponification and esterification with HPT produced thiohydroxamate ester 12 which loses CO2 under reductive radical reaction conditions yielding 13. Opening of one of the dihydrofurans gives a racemic mixture of alcohols 14 which were in turn protected. The silyl group was used as a handle in a Tamao-Fleming oxidation to introduce the terminal alcohol to give after methylation rac–15. The next step in the synthesis is an interesting chiral resolution strategy by a “chiral hydride”. This is transferred from a Ni-(R)-BINAP complex with DiBAl-H as the hydride source. 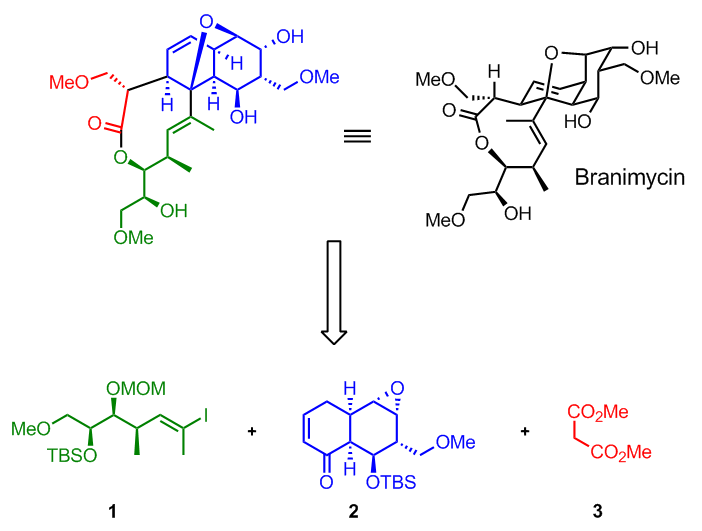 Never saw this kind of strategy in a total synthesis before but it is really a pretty neat solution. Although half of the material got lost in this step it provides rapid access to the blue fragment 2. If you are interested in this step you should have a look into this one . So with enantiomerically pure 16 in hand the alcohol was oxidized and the PMB group replaced with a TBS group. 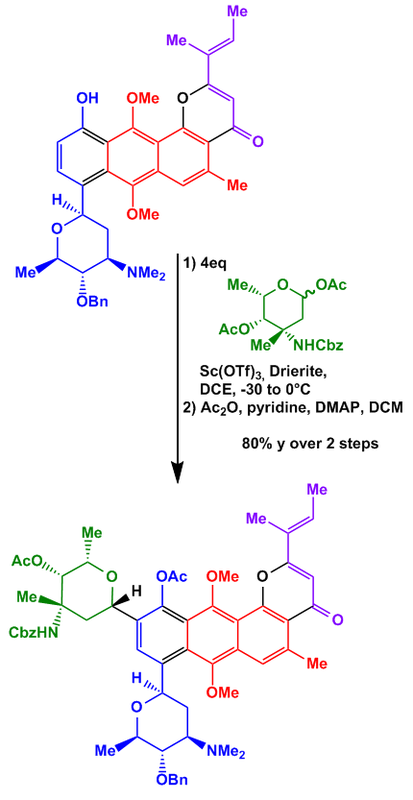 After chemo- and stereoselective epoxidation (maybe guided by the methoxy group?) the blue fragment 2 was ready for the crucial coupling step. Metal/halogen exchange of 1 with tBuLi and quench with 2 generated an alcoholate which immediately opens the epoxide in a 5-exo-tet reaction to give 19. 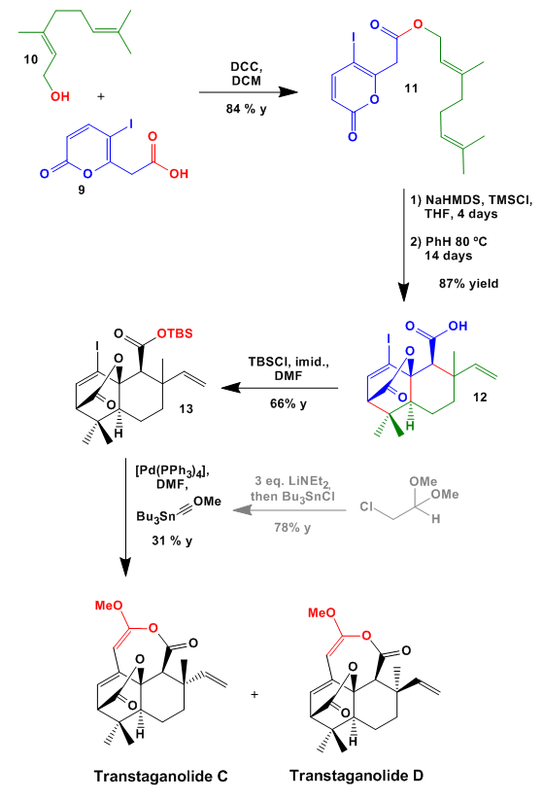 This advanced intermediate was protected as a TBS ether and exposed to Cr(VI) which is known to promote allylic oxidation/rearrangement/oxidation to give in the end an unsaturated ketone. An attempted Claisen rearrangement to introduce the side chain did not give any positive results so the group had to pursue a different route. Michael addition of dimethylmalonate, triflation of the ketone, and reduction saved the day giving 21 in good overall yield. 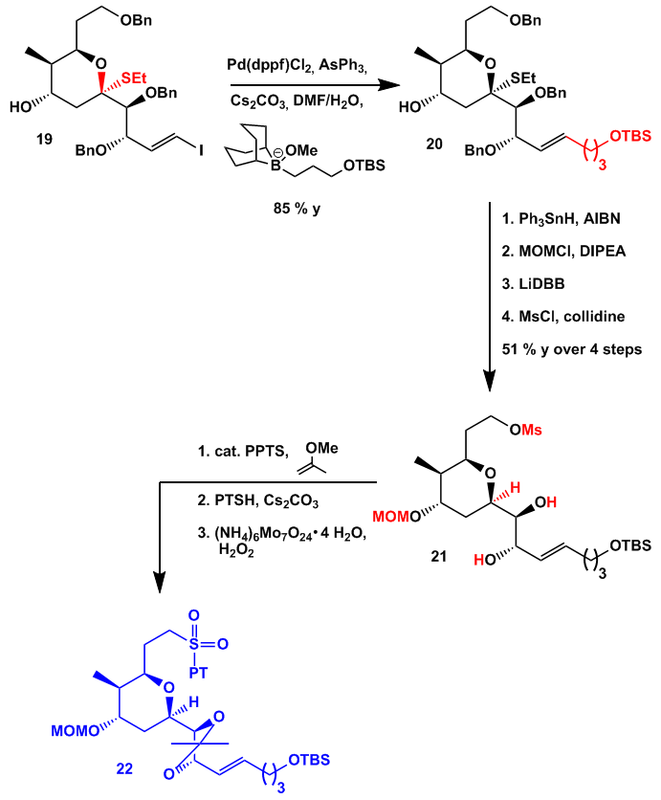 Global reduction with LiBEt3H, selective monomethylation and MOM-deprotection produced diol 22. Chemoselective TEMPO oxidation (primary vs. secondary alcohol) to the aldehyde and Pinnick oxidation gave seco-acid 23. 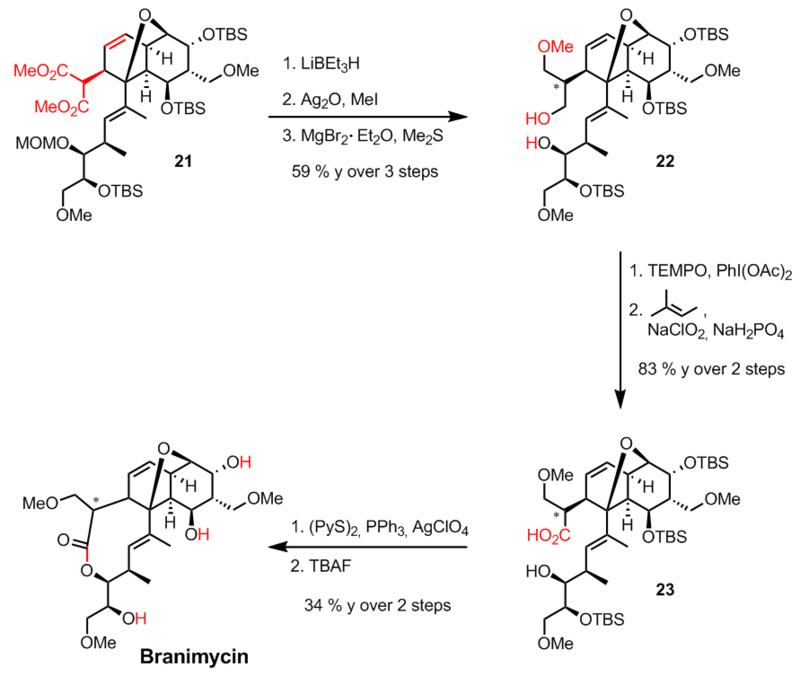 Some macrolactonization conditions were screened but the rather old school Corey-Nicolaou reaction proved to be successful to furnish after desilylation branimycin. As can be seen from scheme 7 it was not possible to control the stereochemistry a to the ester functionality. 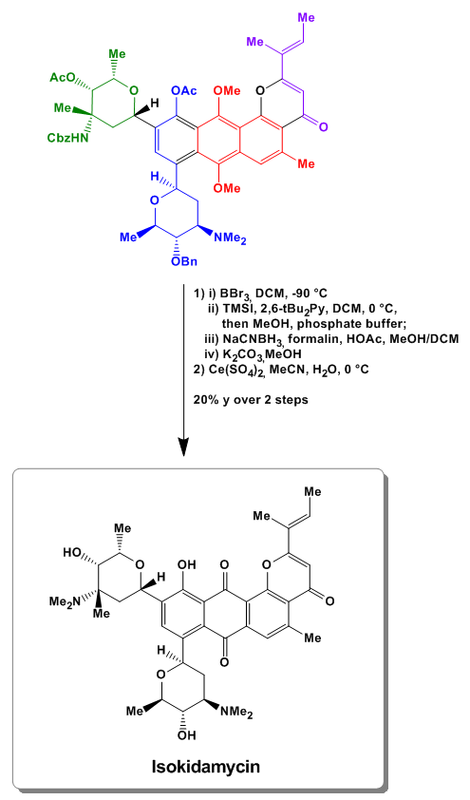 The preceding methylation to differentiate the hydroxy functionalities did not result in any chiral resolution so this stereocenter remains racemic giving at last two diastereomers of branimycin. Nevertheless the absolute of this stereocenter could be unambiguously resolved which remained unclear at the beginning of the story. Sorry for the long delay of posting but I am really busy with finishing my exams and planning my move to the US. 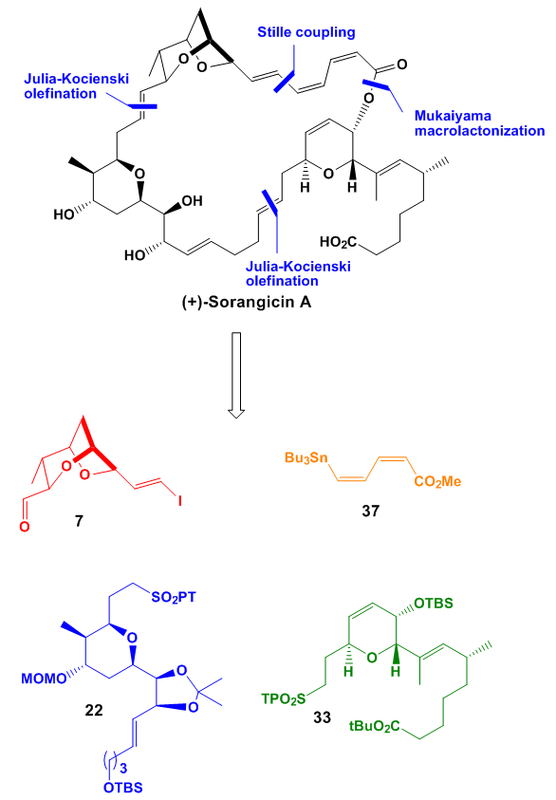 Sorangicin A is an extremely potent antibiotic acting against Gram-positive and Gram-negative bacteria with a MIC ranging from 0.3 to 25 µg/ml, respectively. It inhibits the RNA polymerase of bacterial cells leaving eukaryotic cells unaffected. Besides a dioxabicyclo[3.2.1]octane, 15 stereogenic centers, and a tetrahydro- and dihydropyran ring, this 31-membered macrocycle contains a E,Z,Z-ester motif. The whole story of structure elucidation (and correction) is featured in the cited article. Because the whole is beyond the scope of this write-up interested readers should really have a look at it. This giant beastie is cut into four fragments. The two main fragments, blue and green, are of almost the same and much higher complexity compared to red and orange. 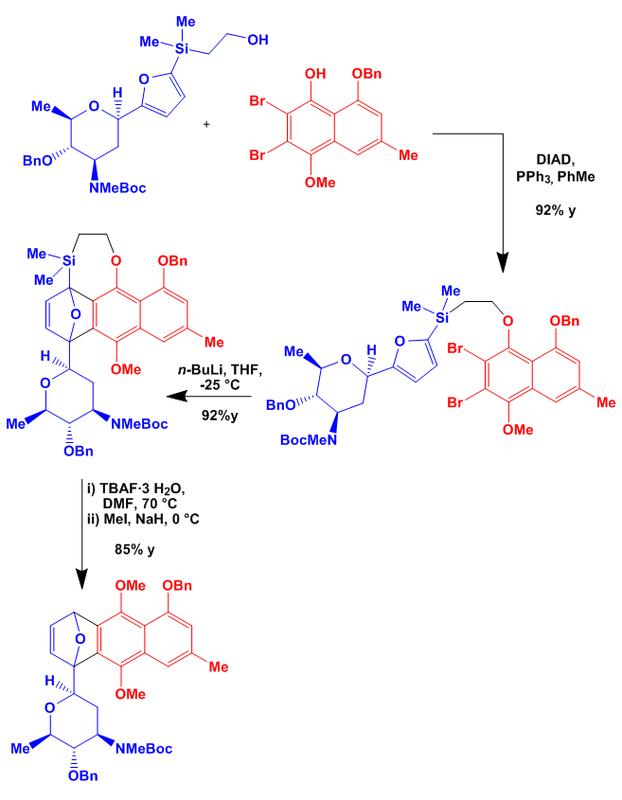 It was planned to connect all fragments via two Julia-Kocienski, one Stille, and one Mukaiyama macrolactonization reaction. Synthesis of fragments 7, 21, and 33 will be presented separately before all were connected to form 36. 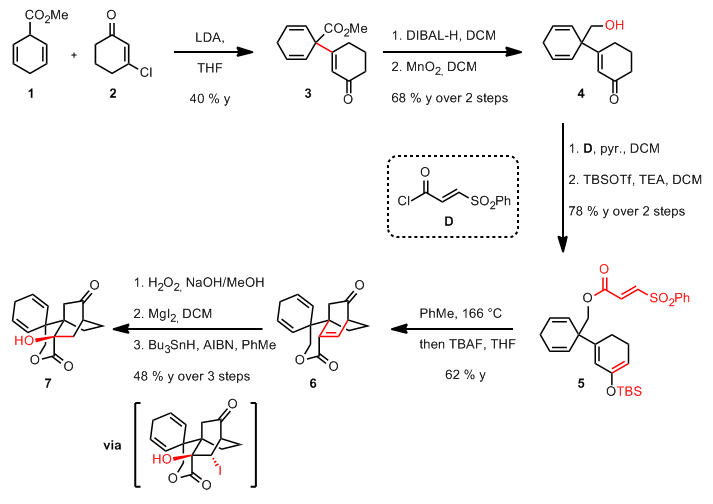 At the outset of the synthesis the acetonide of glyceraldehyde underwent a Cr-catalyzed Diels-Alder reaction with Danishefsky’s diene to give after addition of TFA dihydropyranone 2. Enantioselective Michael addition of in situ formed styryl cuprate and quench with methyl iodide furnished tetrahydropyranone 3. The temporary transmetallation with dimethyl zinc was necessary to suppress double ortho methylation of the resulting enolate. 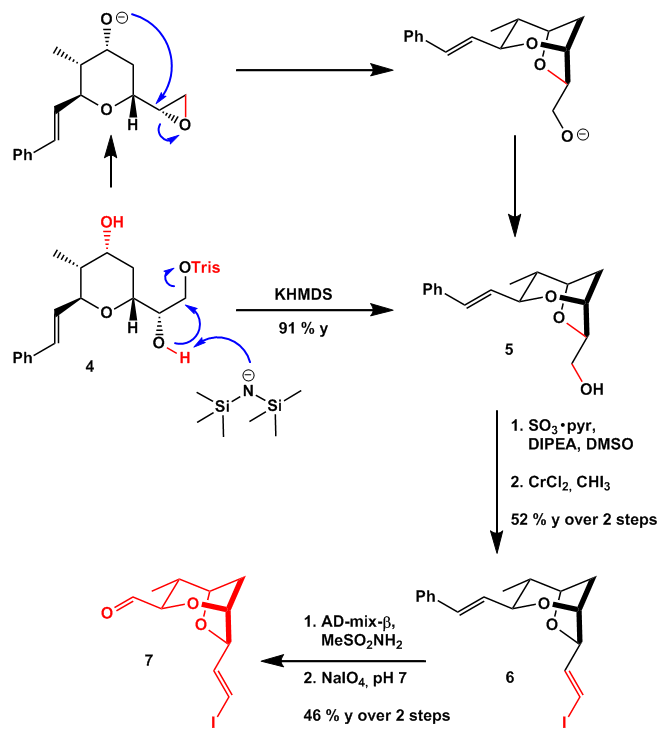 Selective ketone reduction from the less hindered face was followed by acetonide cleavage and trisylation to form alcohol 4. In the presence of KHMDS epoxide formation was induced. Subsequent intramolecular epoxide opening produced the delicate dioxabicyclo[3.2.1]octane in high yield. 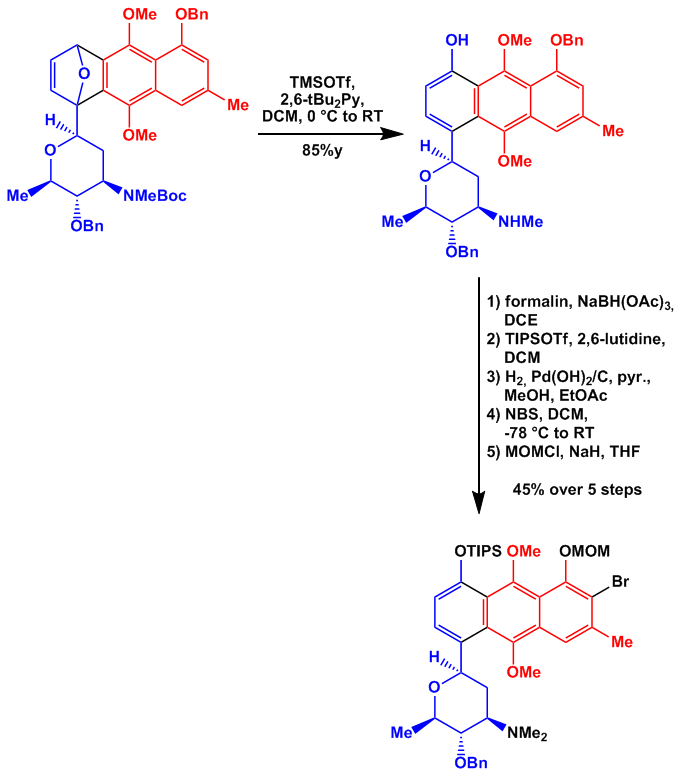 Parikh-Doering oxidation and Takai-Utimoto olefination gave vinyl iodide 6 which was transformed into 7 by means of a dihydroxylation/periodate diol cleavage. Dihydroxylation is chemoselective with respect to the more electron rich double bond. The synthesis of the blue fragment started off with commercially available lactone 8 which was benzylated to give fragment 9. After elective monoreduction transformation of the resulting lactol into alkyne 10 was accomplished with TMS-diazomethane. The alkyne was used to introduce selectively a trans double bond through hydrozirconation. After some experimentation the group found that prior to in situ formation of Cp2Zr(H)Cl (Schwartz’s reagent) in the presence of lithium triethylborohydride the latter one should be added first to form the alcoholate which no longer interferes with the hydrometallation step. Quenching of the metallate species with NIS then gave iodide 11. Parikh-Doering oxidation, reaction of methyl Grignard under Luche conditions, and another oxidation then produced ketone 12. The coupling partner of 12 was synthesized in four steps from amide 13. Aldol reaction of the boron enolate of 13 with the aldehyde shown gave aldol 14 which was transformed into Weinreb amide 15 prior to protection of the free alcohol with TBS and monoreduction with DiBAl-H to give 16. Fragments 12 and 16 were combined through boron enolate chemistry to give aldol 17 in high yield but as a 1 : 1 mixture of diastereomers. Because separation of the diastereomers was easily accomplished both were transformed into pyran 19 through different routes. Desilylation with buffered HF was followed by BF3 promoted thioacetal formation in the presence of ethyl mercaptan to give from diol 18a/b pyran 19 in high yield. In the case of 18b a two step oxidation/reduction protocol was necessary to invert the stereochemistry of the free alcohol. Moving on with the synthesis vinyl iodide 19 was coupled in a neat alkyl Suzuki reaction with a 9-BBN boronate derivative to give olefin 20. Desulfuration of the thioacetal was followed by MOM protection of the free alcohol; triple debenzylation and selective mesylation of the resulting primary alcohol then gave mesylate 21. Acetonide protection of the vicinal diol and replacement of the mesylate with phenyltetrazolyl mercaptane produced after oxidation fragment 22. The third and last main fragment was synthesized from known ephedrine derivative 23. Under Myers conditions amide 24 was produced in almost quantitative yield and excellent diastereomeric ratio. Reductive removal of the auxiliary and subsequent alkynylation under Corey-Fuchs conditions with concomitant methylation gave alkyne 25. Hydrometallation and bromination then furnished vinyl bromide 26 which was combined with dihydropyranone 27. The latter one was synthesized using again the chromium catalyst previously shown in scheme 2 through a Diels-Alder reaction with Danishefsky’s diene. 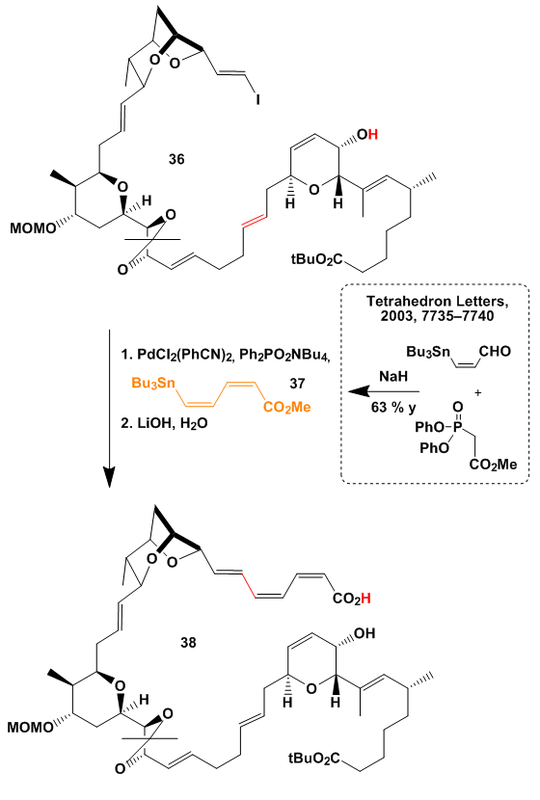 In situ protection of the enolate with TES provided dihydropyran 28. 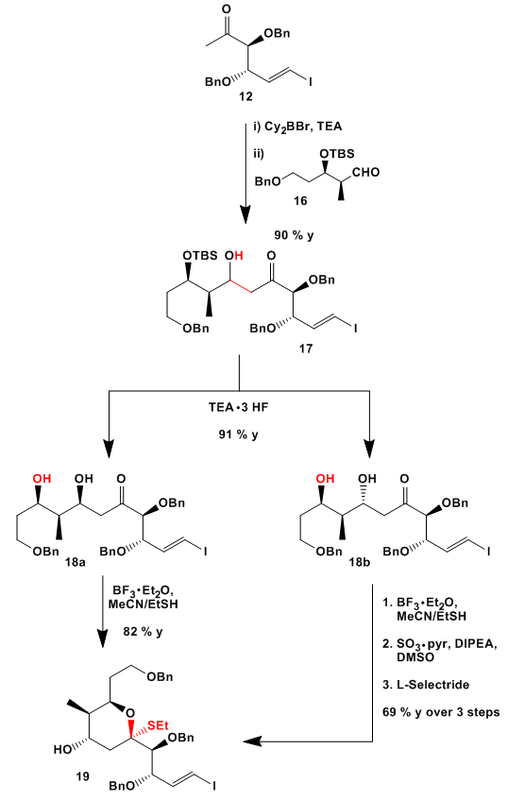 The TES enolate was used in a Rubottom oxidation to yield after deprotection/TBS protection ketone 29. Removal of the unwanted oxygen function was done through triflate formation with Comins reagent and palladium mediated reduction to give dihydropyran 30. 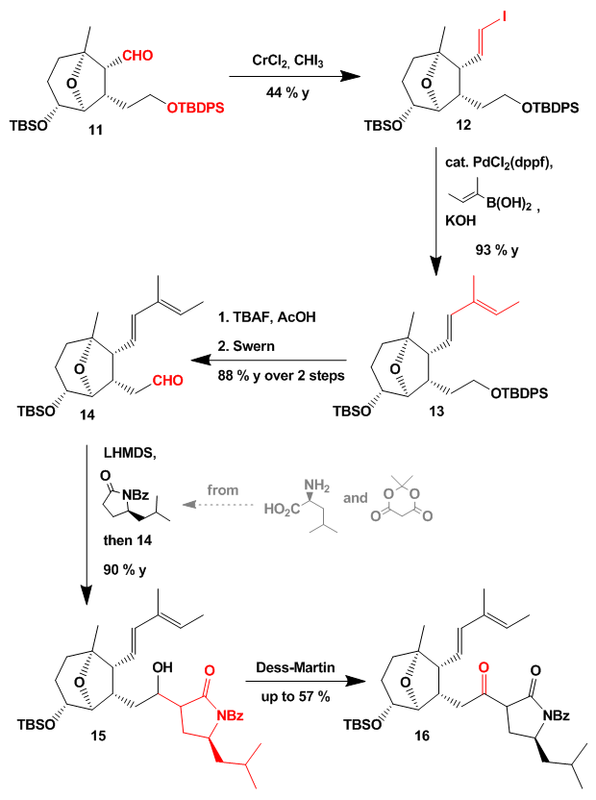 PMB removal was then followed by two step oxidation of the free alcohol to the acid and tert-butylation to yield ester 31. Later on the group found out that the stereochemistry determined for the highlighted alcohol functionality was wrong. So an intermezzo of deprotection, oxidation/reduction, and global TBS protection was necessary to get the diastereomeric product. 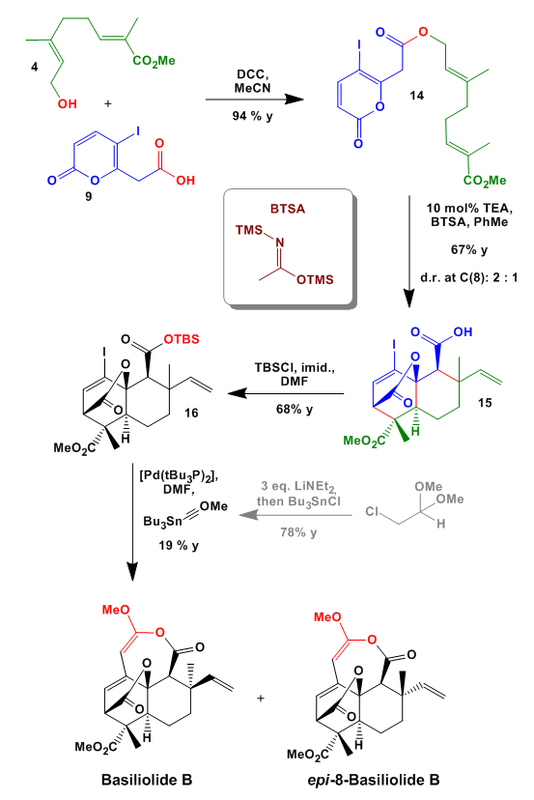 Selective TBS removal, Mitsunobu thiolation and oxidation then gave at last fragment 33. Assembling of fragments 7 and 22 via Julia-Kocienski olefination proved to be problematic. Considerable efforts were needed to get the reaction done. Optimal results were obtained by using tBuLi in the presence of HMPA as the base to give after several cycles product 34 in useful yield. Desilylation with buffered HF was followed by Dess-Martin oxidation to aldehyde 35 which was subjected to another Julia-Kocienski olefination. This time optimum results were obtained with KHMDS as a base to give after TBS removal ester 36 in good yield. Stille coupling of vinyl iodide 36 with stannane 37 which was obtained in one step following a known protocol gave after chemoselective saponification acid 38. 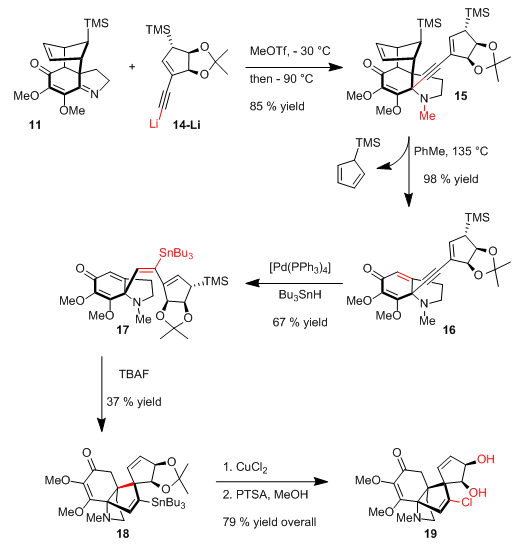 Macrolactonization proved difficult but after some experimentation the group found that good yield could be achieved using Mukaiyama’s modified conditions. 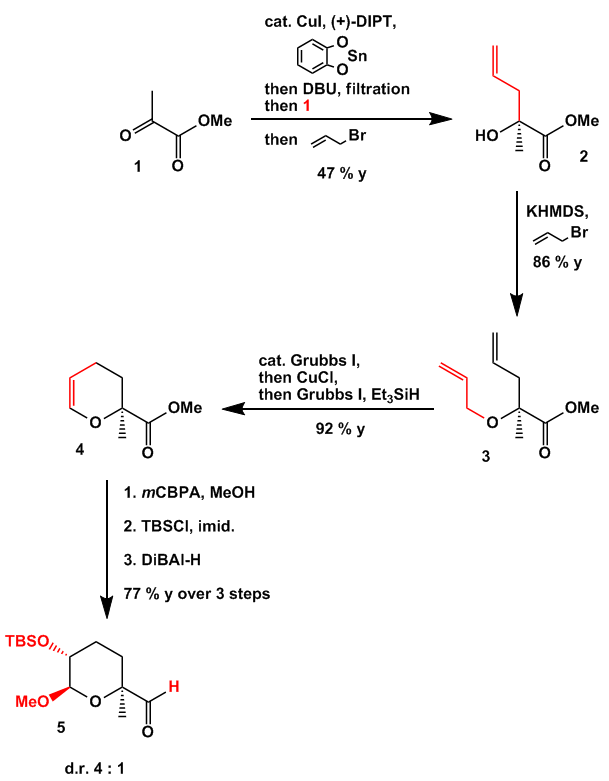 Deprotection of the tert-butyl ester was also problematic so the group first transformed it into a TBS ester. This was necessary because under standard acidic or Lewis acidic conditions the trienoate linkage was harmed. Global deprotection was done with hydrochloric acid to furnish in the end Sorangicin A as a single diastereomer. This is really a huge achievement and with a yield of 3.2 % over 30 steps in the longest linear sequence not so bad J. It features some interesting chemistry namely the cool Diels-Alder reaction, the neat formation of the dioxabicyclo[3.2.1]octane, and the alkyl Suzuki coupling. 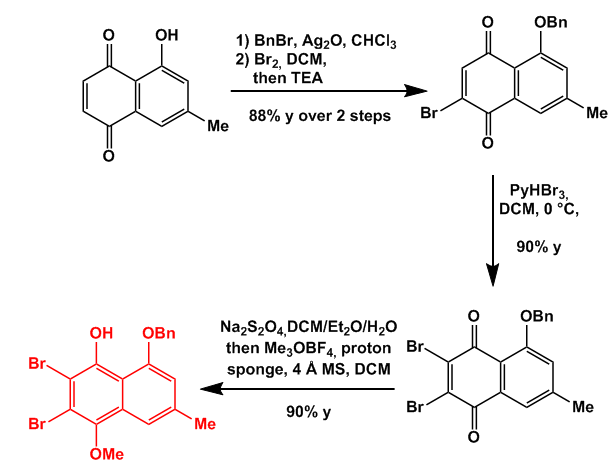 Although the group first got the wrong diastereomer and proved later on that the original published structure was wrong the synthesis is straightforward. THX for reading and comments are as usual welcome. I have never run a Julia-Kocienski olefination to date but I am sure this is only a matter of trial and error. Or does anyone have a good explanation concerning these results i.e. 30 % y, 1 : 1 versus 86 % y, only E? 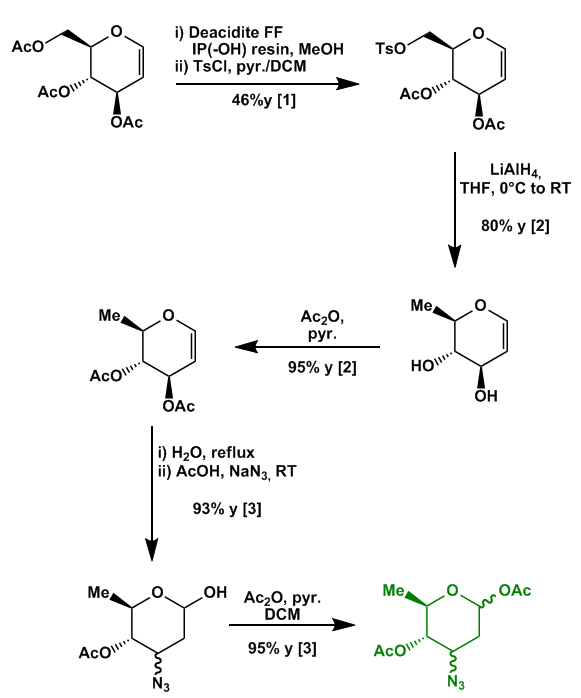 By employing standard Yamaguchi or modified conditions the sensitive trienoate linkage isomerized to some extent by a Michael addition of DMAP. Using a Mukaiyama reagent modified by Evans, the group worried about the iodide counterion which might react in a similar manner. Did anyone of you ran into similar problems during macrolactonization chemistry? 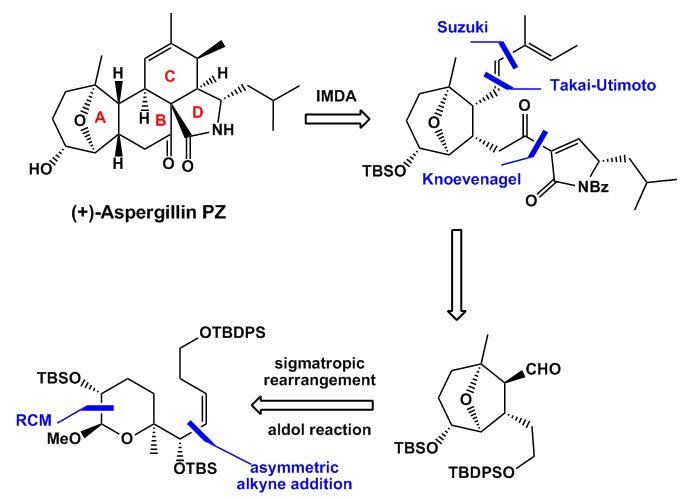 Aspergillin PZ was isolated in 2002 by a Chinese group from a soil fungus and contains an interesting 12-oxatricyclo[6.3.1.0]dodecane ring system. Its structure is very similar to that of Aspochalasin D and Cytochalasin D. Aspergillin PZ displays some potential against various cancer cell lines but due to low supply of material an evaluation of the biological profile was not possible. An obvious disconnection is the opening of the C-ring via an intramolecular Diels-Alder reaction (IMDA). The unsaturated side chain might be installed through a Suzuki cross coupling of a vinyl iodide which arises from Takai-Utimoto olefination of the corresponding aldehyde. Disconnection of the lactam then furnishes an aldehyde which could be produced through a sigmatropic rearrangement/aldol process. The first few steps are only described in the supporting information. Starting from methyl pyruvate the first chiral center was produced using an asymmetric allylation reaction of in situ formed allylstannane. Allylation of the free alcohol in 2 gave ester 3 which was cyclized in the presence of Grubbs I. The resulting double bond was isomerized in the same pot. I am not entirely sure why they add CuCl. 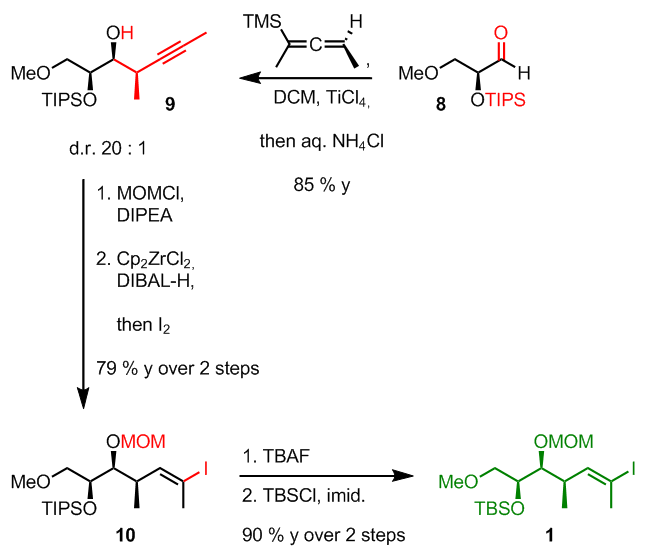 Epoxidation and regioselective epoxide opening with methanol was followed by TBS protection and ester reduction to give aldehyde 5. 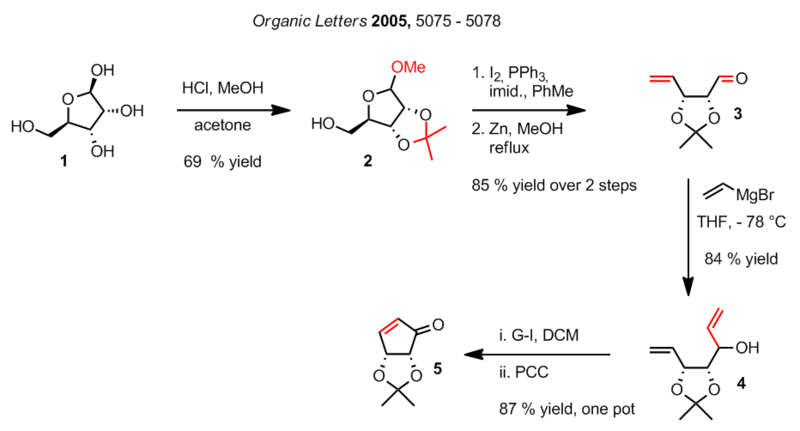 Stereoselective alkynylation under Carreira’s conditions (I think it is used in every synthesis I posted the last months…) gave alcohol 6 in very good yield. TBS protection and cis selective reduction of the triple bond reproducibly furnished pyran 7 in over 85 % yield. Sigmatropic rearrangement/aldol reaction was accomplished with SnCl4 to give aldehyde 8. Unfortunately the reaction furnished the wrong diastereomer with respect to the aldehyde motif. It was not possible to identify a useful protocol to invert this stereocenter so the group went through a 7 (!) 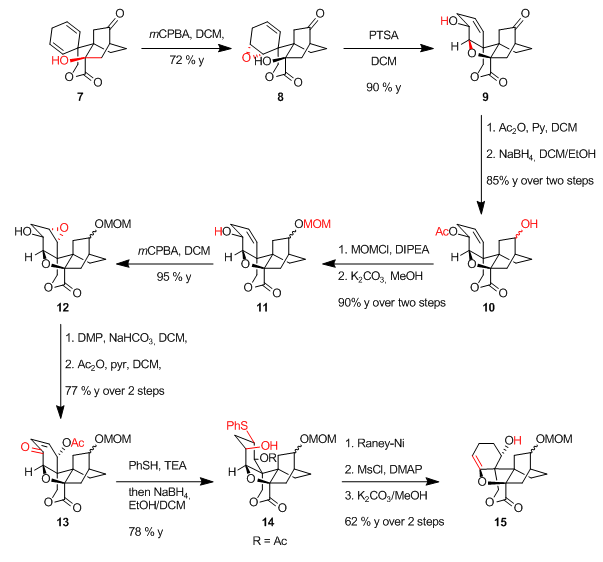 step reaction sequence. TBDPS removal in the presence of a TBS group was done with TBAF. Pinnick oxidation of the aldehyde to the acid and esterification under standard conditions led to lactone 9. Having the internal anchor in place it was possible to get the inversion done with DBU as the base. 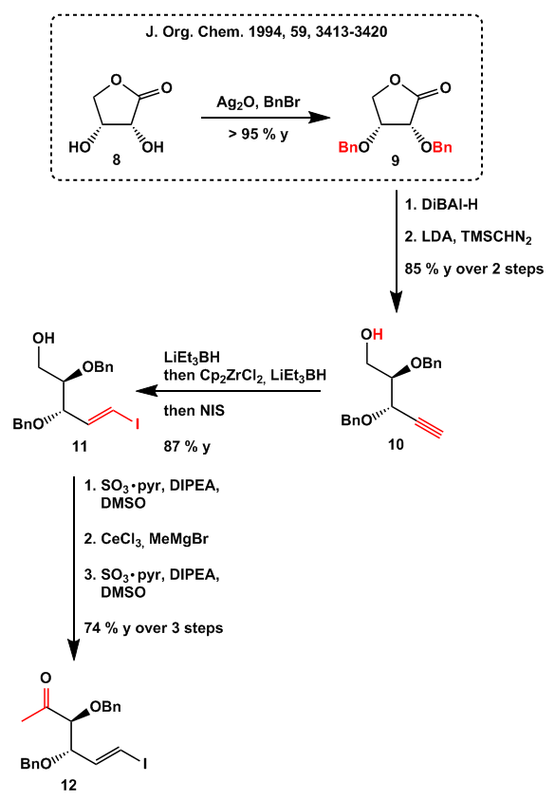 Lactone reduction, chemoselective TBDPS protection and Ley oxidation then gave aldehyde 11 with the correct stereochemistry. The group first planned to install the highly unsaturated side chain via some Wittig chemistry but all attempts were unsuccessful. 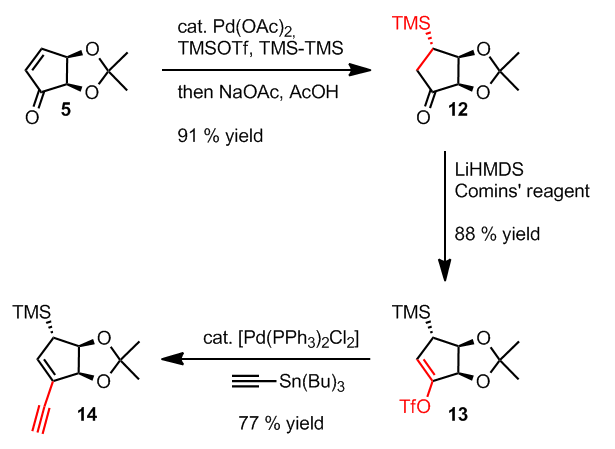 So Takai-Utimoto olefination was chosen and followed by Suzuki cross coupling to give 13. Again TBDPS removal and Swern oxidation gave aldehyde 14 which was reacted with a lactam made from leucine and meldrum’s acid. DMP oxidation of the resulting alcohol furnished 16. What remained was the installation of the double bond which was accomplished through selenation/oxidation/elimination under standard conditions. Upon heating the IMDA proceeded to give pentacycle 18 in good yield. Debenzoylation and TBS removal gave at last Aspergillin PZ. Under Lewis acid catalysis the methanol is eliminated to give an oxocarbenium ion. A sigmatropic rearrangement then gave a silyl enol ether which undergoes an aldol reaction to give after hydrolysis aldehyde 8. 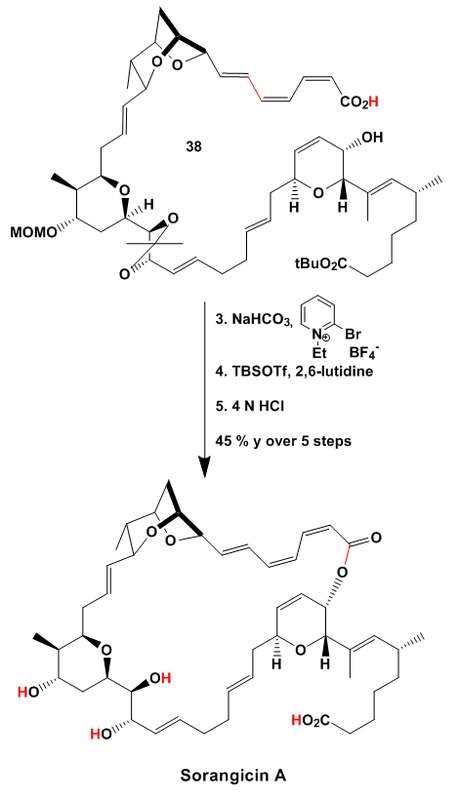 The stereochemistry of this step should be a consequence of steric hindrance between the bulky protecting groups. All in all a nice synthesis except the unproductive inversion protocol. The authors state that further studies are on the way to get the right stereochemistry in place. 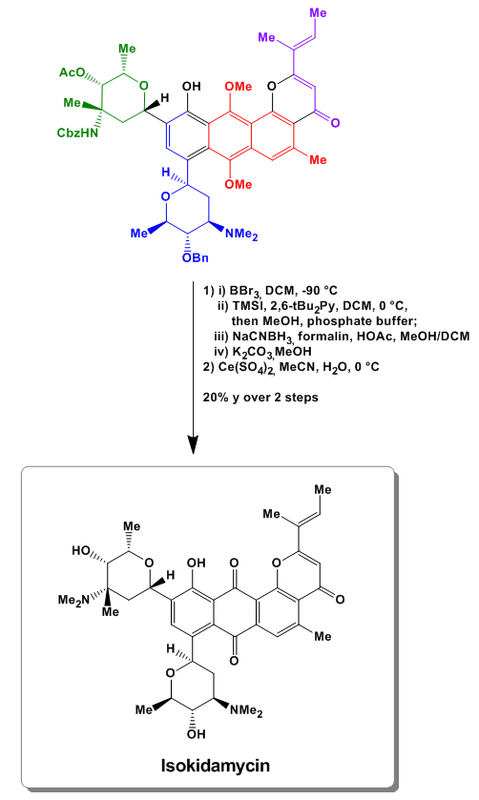 This time a rather short synthesis but with some cool chemistry in it. As can be seen from the papers cited by the Stoltz group, a lot of working groups are currently working on this subject. The main problem of all approaches is the endgame of the synthesis and not the impressive IMDA reaction utilized by most groups to build the core structure. 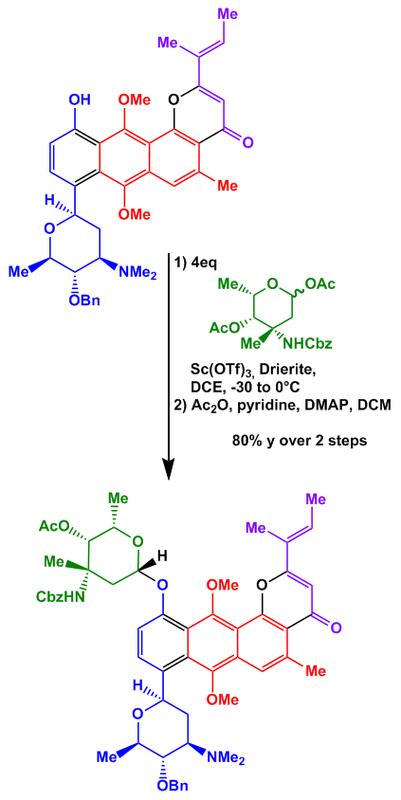 Because all stereocenters came from one step which is done without any chiral control, the synthesis yields an epimeric mixture of the natural product. The paper only cites the synthesis of the first fragment so I added it for the sake of completeness. 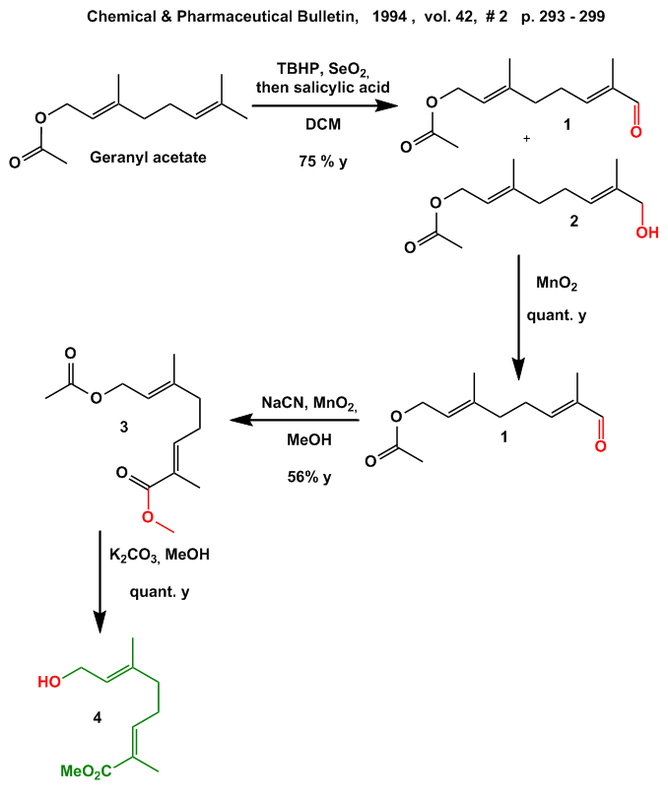 The synthesis of the green fragment starts from commercially available geranyl acetate. This was oxidized to the ester through a sequence of allylic oxidation and manganese dioxide mediated two step oxidation to give ester 3. Removal of the acetate then yields alcohol 4. The blue fragment was synthesized from methyl propiolate which was iodinated under acid catalysis to give selectively the Z-product. This was exposed to standard Sonogashira conditions and coupled with butynol to give 7. Lactonization with iodine monochloride and subsequent oxidation furnished crude acid 9 which was used without further purification. 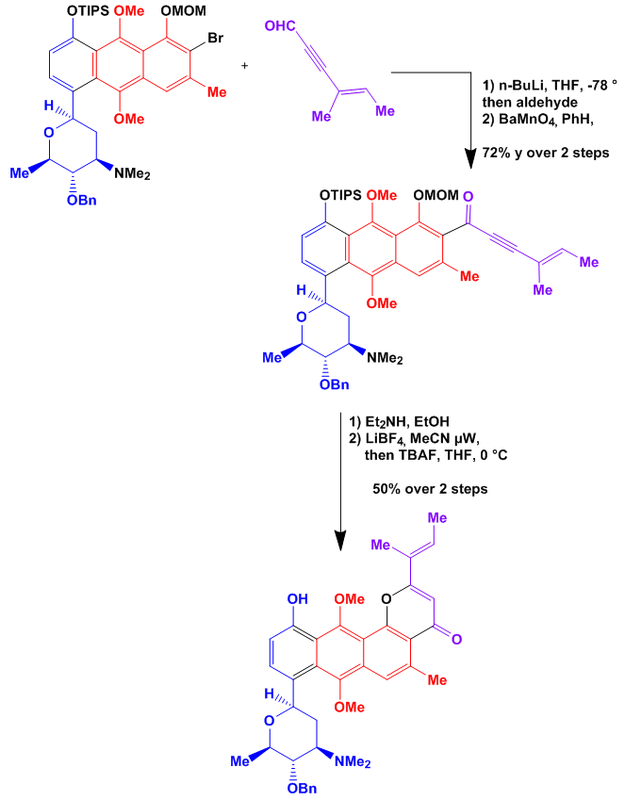 To test in principle the crucial Claisen/IMDA step, the blue fragment was coupled with geraniol 10 under standard conditions and exposed to well known conditions to form first the enol ester and rearrange this to tricyclic compound 12. Although the yield is pretty good, the reaction took 18 (!) days to reach completeness. Nevertheless Sonogashira coupling under standard conditions after protection of the ester furnished Transganolide C and D in moderate yield. For the preparation of the Basiliolides the synthesis was optimized. 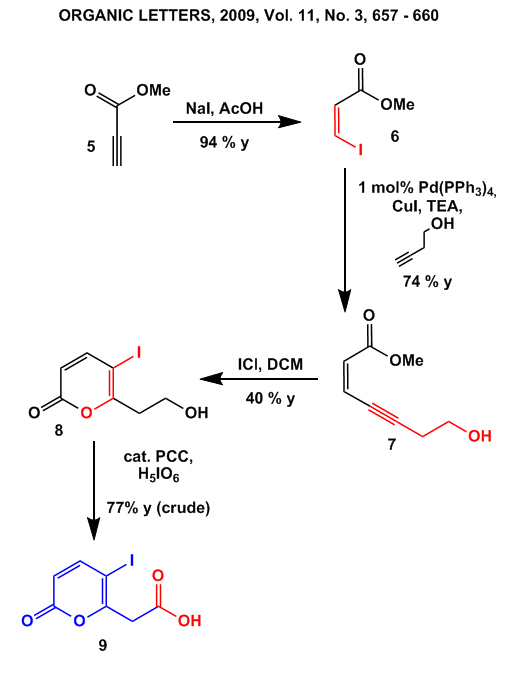 First both fragments were coupled in the presence of DCC which set the stage for the Claisen/IMDA reaction as before. 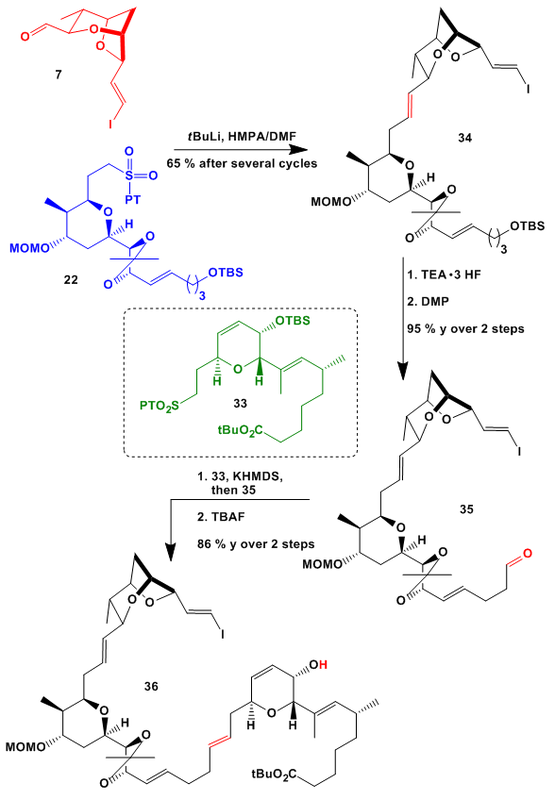 By adding two equivalents of BTSA and a catalytic amount of TEA to a solution of 10, tricyclic compound 11 forms in excellent yield and high diastereomeric purity in only 2 (!) days . TBS protection of the acid proved crucial for the final step. Stille coupling with the ethinyl stannane shown produced directly an epimeric mixture of Basiliolide B albeit in low yield. 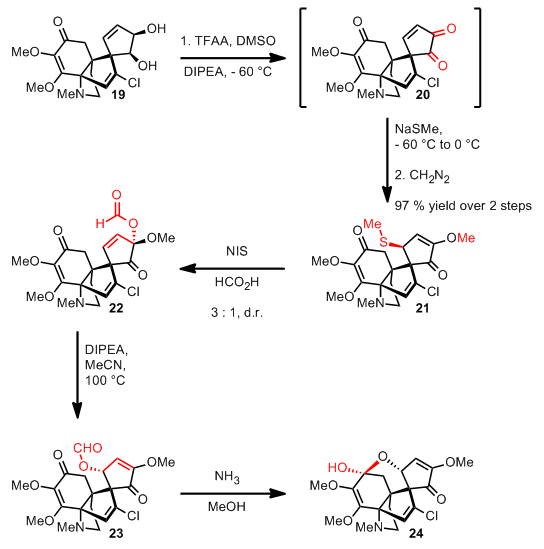 So at last here is the cool Claisen/IMDA-reaction step. 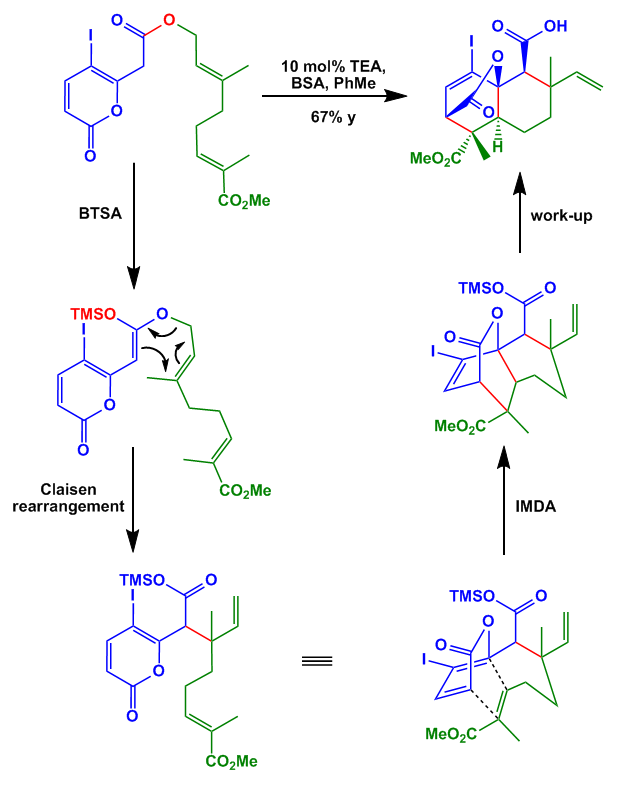 First BTSA forms the TMS enol ester which undergoes a Claisen-Ireland rearrangement. Now with all double bonds in the right place Diels-Alder reaction forms the remaining two bonds to give the core structure of Basiliolide B.
I am very busy these days but hopefully I get a second review done this month. THX for reading my stuff. And THX to Bobby for proofreading in advance. The synthesis includes various intermediates and a long linear reaction sequence so I will start right off with the red fragment. Benzylation of the benzoquinone promoted by silver oxide was followed by monobromination. The second bromine was added with the help of pyridine tribromide, the quinone reduced to the dihydroquinone and selectively monoprotected as the methyl ether. For identifying the route to the green fragment I had to dig out some really old papers which are cited by the group. The reconstruction was done as described in the paper but might not be 100% correct. I suppose they started with the dihydropyran shown which is commercially available. 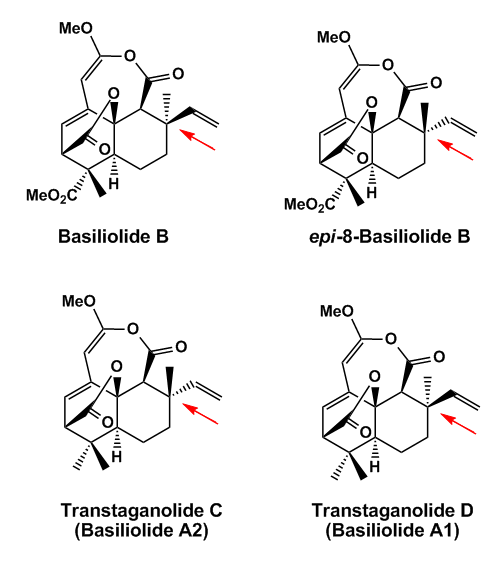 Monodeprotection and subsequent tosylation was followed by reductive cleavage of the tosylate and the acetyl protecting groups. 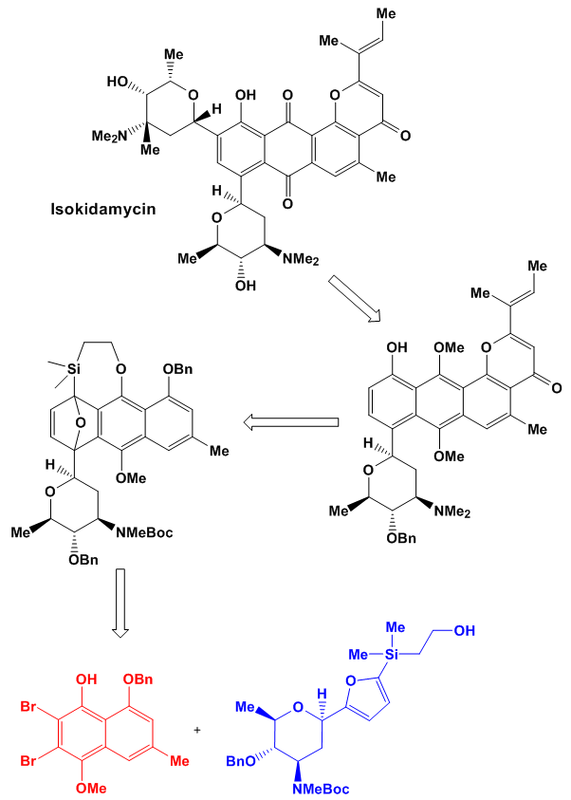 Reprotection, hydration of the double bond and azidonation delivered after acetylation the green fragment shown. The hydration/azidonation step goes through a SN2’ reaction in which water (or even hydroxide) pushes out the acetate. Protonation and azide addition on the double bond produces the product. The sugar fragment was then coupled under Lewis acid catalysis with furan (d.r. 72 : 28 with respect to the C3 stereocenter) and deprotected under standard conditions to give after chromatographic separation the major C3 epimer shown. 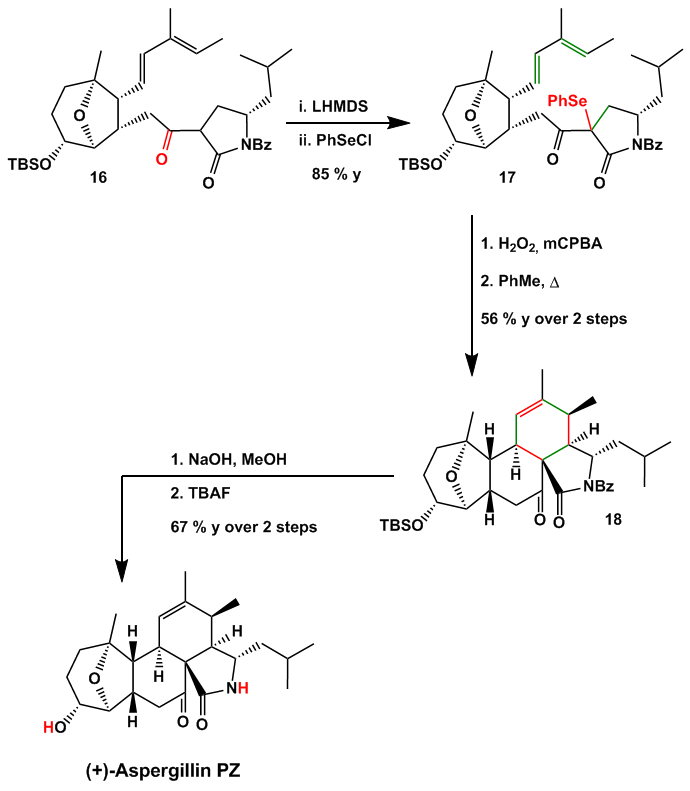 Benzylation, azide reduction, Boc-protection and methylation gave the fully protected THP. Functionalization of the furan was accomplished by silylation followed by hydroboration/oxidation to give the terminal alcohol. Another interesting THP fragment was isolated from vancomycin (!). By protecting the natural product and heating it in a methanolic solution of HCl, the aminosugar was set free. Some protecting group manipulations furnished the second sugar unit. It seems to be odd to destroy such an important drug like vancomycin to produce this aminosugar but the author explain this sequence with the extremely long synthesis otherwise needed. Now it’s getting interesting. The red and blue halves were combined through a Mitsonobu reaction in pretty high yield. In the presence of BuLi the 1,2-dibromonaphthalene produces an aryne intermediate which undergoes a Diels-Alder reaction with the furan ring. The ether handle was then cleaved off with TBAF and the resulting alcohol methylated. A really nice way to build up the anthracene ring system. 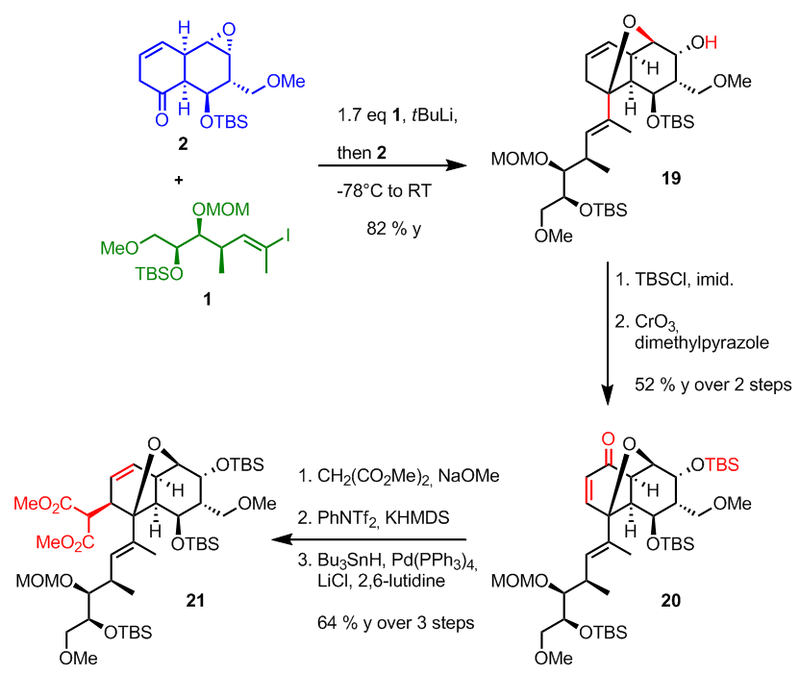 The oxacyclic ring was opened with TMSOTf with concomitant cleavage of the Boc protecting group. Reductive amination, TIPS protection of the free alcohol, selective debenzylation, bromination and MOM protection furnished the fully protected anthracene ring system. For the next step another intermediate was needed. A Corey-Fuchs alkynylation followed by in situ formylation gave the purple aldehyde shown. This aldehyde was added to the anthracene ring through standard conditions and the resulting alcohol oxidized with barium manganate. Addition of diethylamine to the triple bond gave rise to a vinylogous amide which cyclizes under Lewis-acid catalysis which was followed by desilylation. Ok, we are approaching the end. Glycosidation of the advanced intermediate with the vancomycin derived aminosugar was only possible in the presence of Sc(OTf)3. During the course the acetyl protecting group was cleaved off so it was reinstalled. At last the protecting groups had to be cleaved off. 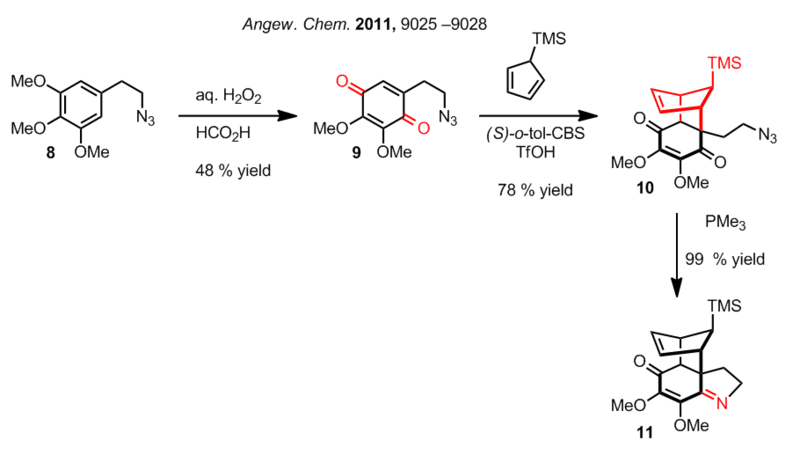 Benzyl group removal was done first with BBr3, the Cbz group was removed in the presence of TMSI which was followed by reductive amination of the free monomethylated amine. The hindered acetate group was cleaved off under standard conditions and the two methyl groups removed oxidatively with cerium sulfate to give isokidamycin. Wow… what a damn long and cool synthesis. Only two papers in JACS… I bet some generations of Ph.D. students were needed to get this done.